The neon lit “Brill” from the back of the cafe. 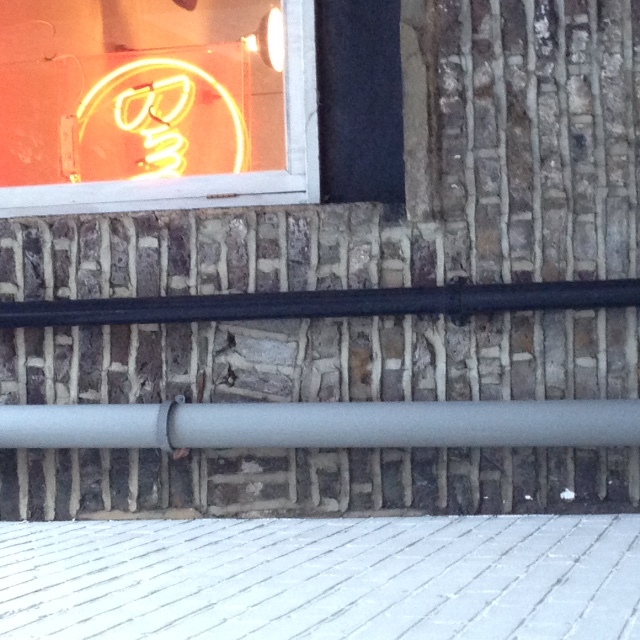 You can also see evidence of an old arch in the brickwork, an old doorway? Brill on Exmouth Market has quite a history. Originally a record store, it has evolved into a music shop/cafe more recently. On my recent visit, I ordered a very good Americano (beans from Officina Coffee Roasters) and although cakes were on sale, it was a small bar of Green & Blacks chocolate that appealed to me a bit more that day. It is a small cafe and so the few seats that are upstairs were occupied. This turned out to be a good thing though because I noticed a sign indicating that there were more seats downstairs, which actually meant that there was seating in a lovely little courtyard/garden at the back of Brill. Although it was originally locked (it was February and fairly dismal when I visited, who in their right mind would want to sit in the garden? ), the friendly staff unlocked it and quickly cleaned one of the tables so that I could enjoy my coffee and chocolate in peace in central London. Indeed, the occasional (inevitable?) sound of sirens in the distance only served to emphasise the tranquility of the courtyard. 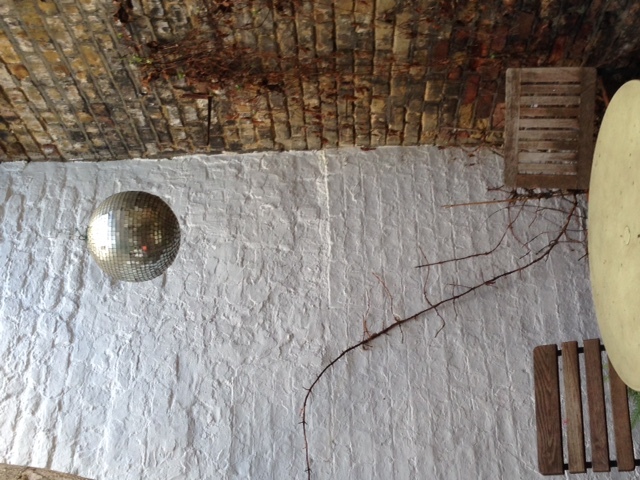 The courtyard has four tables and a glitter-ball in the corner hanging from a tree. There was a lot to appreciate outside, both in terms of the science and the history of the place: Leaves deposited by vortices in corners of the yard with brickwork that suggested a significant re-build has occurred to this cafe. 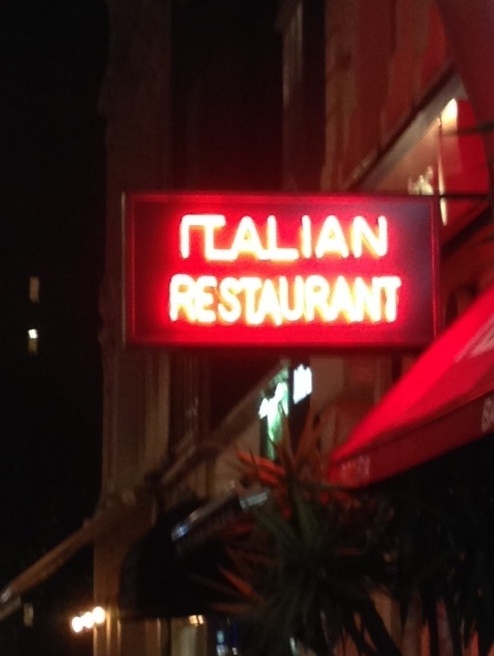 But from my vantage point, it was the word ‘Brill’, lit up in neon lighting inside the cafe, that caught my attention. Neon lights are always interesting to me because their colour is so suggestive of the atoms that make up the light. The colour of a neon light is determined by the energy levels of the atoms that make up the light, the gas ‘neon’ shines red, hence neon lights. But if you wanted blue ‘neon’ lights you could use mercury as the vapour in the tube instead of neon, it is all about the energy levels of the atoms in the gas in the tubes. Under certain conditions, cadmium also emits a red light which brings us to the subject of this cafe-physics review: The definition of length. How is it that we can all agree on what ‘one metre’ is, or even one ‘inch’? Perhaps you are wondering how the red light emitted by cadmium, (or neon), relates to the definition of the metre? It’s about standards and definitions. Up until about 1960, the standard unit of length (the metre) was measured with reference to an actual, physical, metal rod kept in Paris with two scratches carved into it, one metre apart. Any arguments about the precise length of a metre could be settled by referring to the metre, this metal bar in Paris. But of course there were problems, the first of which was that the metre was in Paris. Perhaps you would think it easy to make copies? Yet in the nineteenth century this was already becoming a problem, the measurements that were being made were becoming too precise. Anders Ångstrom’s pioneering work with spectroscopy (investigation of elements by the colours that they emit/absorb) revealed a small difference between the metre kept in Uppsala (where Ångstrom was based) and that kept in Paris. Although the difference was tiny, when it was compared with what people had started to measure, it became significant. Then there was the question of the scratches: Would you measure the metre between the furthest two points of the scratch? Or the closest? Then an even worse problem was discovered: The rod was shrinking! If you’re tempted to abandon metric units and hark back to Imperial units, bear in mind that the UK Imperial Yard was shrinking even faster. No, something had to be done and that something involved changing the definition of the metre fundamentally. It is here that cadmium comes in to the story. Rather than use a physical length that we could all measure, the people whose job it is to define our base units decided that the definition of the metre would be with reference to the wavelength of the red light of Cadmium. I do not know why they did not want to use the red of neon lights but even with cadmium it quickly became apparent that there was a problem. The problem was that cadmium exists as several isotopes, all having a very slightly different ‘colour’ of red light that they emit. So, rather than cadmium, in 1960 they settled on the orange line of Krypton as the definition of the metre. One metre was then defined as 1650763.73 vacuum wavelengths of Krypton. That was the definition for over twenty years before the definition of the metre was updated again in 1983. It is now defined as “the length travelled by light in a vacuum during a time interval of 1/299792458 of a second”. Perhaps it is not a definition that you or I could use, we’d probably still refer to our metre rule! Nonetheless this definition does allow people to perform experiments that need very precise and very accurate measurements of lengths. These standards are important for extremely sensitive measurements such as that needed to detect gravitational waves with the LIGO experiment, reported a few weeks ago. The neon lights at ‘Brill’ do indeed suggest a story that goes way back in time, both for the cafe and for the science.